Spirit Airlines released a report detailing what consumers hate about airlines. Not surprisingly the company took the brunt of complaints. Back in July, Spirit Airlines announced its “hug the haters” campaign which included an invitation for consumers to share just what they hate about flying with the airline and others operating in the United States. And, as it turns out, travelers don’t exactly want to hug Spirit back. Spirit released a State of the Hate report [PDF] detailing just what consumers don’t like about airlines and attempting to downplay its own role in the not-so-friendly lovefest. The campaign, which offered 8,000 Spirit frequent-flier miles to anyone willing to “unleash the hate,” attracted 28,205 consumer responses. While it should come as no surprise to anyone that Spirit received the most complaints – the company has years of being far and away the airline with the highest level of passenger complaints under its belt – it should be even less unexpected that its continually mocked CEO Ben Beldanza would try to spin the negative feedback into something positive. 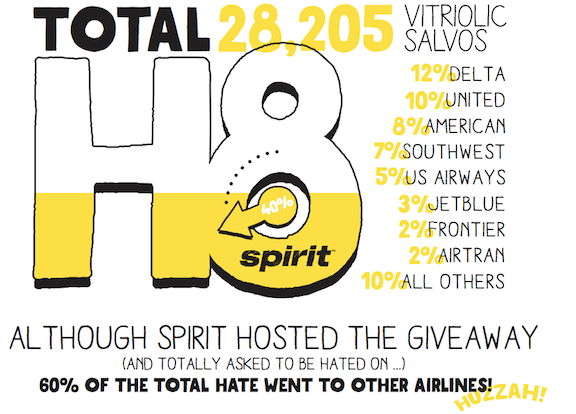 Baldanza goes on to gladly boast that Spirit accounted for only 40% of the hate, but fails to mention that the remaining 60% of hate was sprinkled onto more than eight other airlines. Although Spirit was proud to only receive 40% of the hate from respondents, the figure still far out weighed the hate for other airlines. That means Spirit’s 40% was still three times the amount of displeasure travelers had with the next closes airline. As for what aspects of flying consumers hated on the most, it was the seats: “absolutely everything about them” including size, shape, getting to them, leg room and reclining, the report states. The next biggest overall complaint came in the form of frustrations over lost bags and baggage policies. The report goes on to list the different types of complaints and which airlines received the highest number of those complaints. Not surprisingly, when it came to Spirit most complaints centered on the company’s fees. Spirit’s a la carte approach to ticket prices — which make things like carry-on baggage or in-flight beverages an add-on — has earned it a reputation as a nickel-and-diming carrier whose airfares aren’t as low as they appear once you factor in some of the things you’d get standard on other airlines. While the airline pitches the add-ons as options, consumers don’t see it that way, with the airline receiving 18% of its hate for fees. It was consumers’ distaste for such fees that started the “hug the haters” campaign to begin with, Baldanza said back in July. 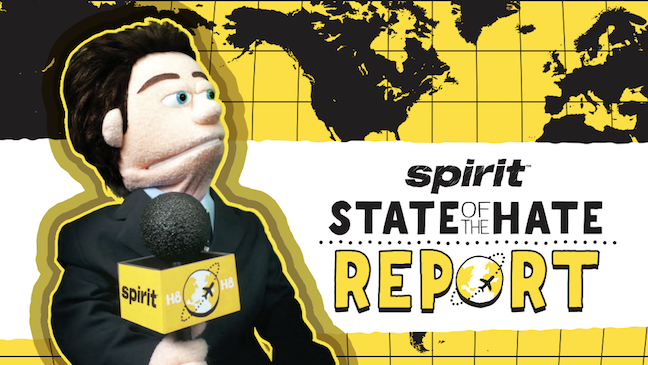 So what exactly does Spirit hope to get form its latest campaign, besides a bucket of vulgar words and spreading the blame? According to Baldanza, the opportunity to have a more rational dialogue about the airline and what it offers consumers.